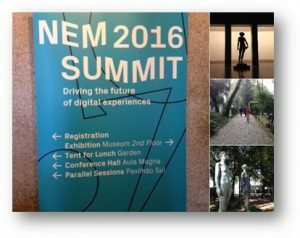 Cap Digit al, Images & Réseaux, Imaginove and Pole Media Grand Paris attended the 2016 edition of the NEM summit in Porto on Nov. 23-25 devoted to driving the future of digital experience. 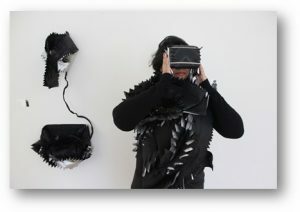 The New European Media (NEM, www.nem-initiative.org, @NEM_ETP) initiative is a Horizon 2020 European Technology Platform (ETP) dedicated to content, and dealing with Connected, Converging and Interactive Media & Creative Industries. It was a great opportunity for clusters representatives to meet the NEM community composed of 1000+ members (Start-ups, SMEs, academic institutions, standardization bodies and government authorities alongside major industrial players, content providers, creative industries, broadcasters, network equipment manufacturers, network operators and service providers). 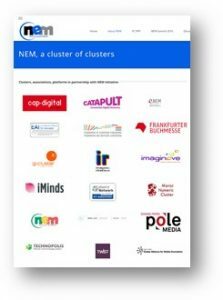 Driving the future of digital experience : The NEM Summit is an international conference and exhibition, open to co-located events and organised every year since 2008 by the NEM Initiative for all those interested in broad area of Media and Content. 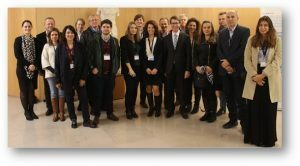 Over the years, the NEM Summit has grown to become an annual not-to-be-missed event, providing attendees with a key opportunityy to meet and network with prominent stakeholders, access up-to-date information, discover latest technology and market trends, identify research and business opportunities, and find partners for upcoming EU-funded calls for projects. Building on successful previous Summits, the 2016 edition will address many of today’s hot topics on Driving the Future of Digital Media Experiences. These will include research and business challenges, societal and user needs including accessibility, implementation requirements for smart content and media convergence, and the regulatory and standardization environment. Participants from around the world : The NEM Summit is attended by participants from Industry and the Electronic Media segment Research network and, more generally, of Information and Communication Technologies. Start-ups, SMEs, academic institutions, standardization bodies and government authorities are present alongside major industrial players, content providers, creative industries, broadcasters, network equipment manufacturers, network operators and service providers. A vibrant 2016 edition with international speakers and European Commission : The first vision day was dedicated to key presentations shaping the challenges and the future of the Content Industry dealing with Connected, Converging and Interactive Media & Creative Industries. Beyond the new challenges in media, content, and creativity sectors presented the European Commission, the program is including presentations on the collaboration economy in media and creativity sector and on the 5G Networks opportunities for Media and Entertainment. The second community vision day was an opportunity to meet the NEM members around several parallel sessions dedicated to : the Media & ICT for the Creative Industry, the Start-up Forum, the Challenged of Media Access today, the Networking Camp for the Cultural and Creative Industries, the Immersive and Interactive Media Experiences, the NEM Club of Clusters (building an effective digital and creative clusters community animated by Josephine). Within the NEM Art & Design Competition, a NEM price was awarded in the closing ceremony for those Innovative Technologists and Artists from Europe having submitted their own creations, using new technologies such as Immersive (Augmented Reality / Virtual Reality), Artificial Intelligence & Machine.